Andrea Delgado shares how she became an "advocate of advocates," bringing individuals and their stories to Capitol Hill. Earthjustice Legislative Representative Andrea Delgado doesn’t get nervous when she walks into a crowd of unfamiliar faces, even when they belong to members of Congress. Growing up in Ecuador and later in the United States, she moved often, becoming fluent in the art of meeting and reading new people. And at age two, she was already helping her politically-active family to get out the vote. In this Q&A interview, Andrea shares how her early introduction to politics and ease among unfamiliar audiences serve her well in advocating on Capitol Hill today for stronger environmental health regulations for all people, especially those most impacted by environmental harm. Tell us about your first brush with politics. Once, when I was two, I tried to hand out voting leaflets in the middle of a church. One of my family members was running for office, and I guess I didn’t understand that there are some places you shouldn’t be telling people who to vote for. Because it was such a big part of my life, I didn’t really understand when it was inappropriate to try to get out the vote. In many places around the world, it’s not easy to speak out about political issues. What was it like growing up in a politically-active household in Ecuador? My grandfather, my grandma and my father were teachers and union organizers, so they were very actively engaged and always organizing and monitoring what the government was doing at local and national level. And if there was any malfeasance, they were not ones to grumble discreetly and keep it to themselves. When I was younger, my father and uncles would tell me about how my grandfather was retaliated against for speaking out against Ecuador’s military regime of the 1970s. He lost his job and was kept captive in a really remote area of the Ecuadorian Amazon, away from his family. 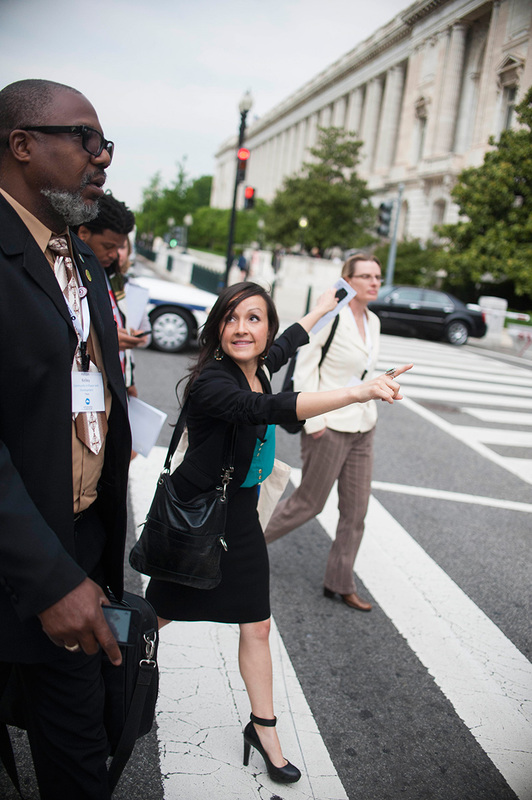 Andrea, center, walks with community lobbyists to meetings in Congress with their senators and representatives, during a 2013 fly-in event. My father was in the leadership of the teacher’s union in the state and my uncle was president of the national federation of university students in Ecuador. So at an early age I learned that speaking out and standing up for what’s right was fundamental because silence is a breeding ground for injustice. I always saw my uncles and my father as fearless, and that inspired me because I feel like I’m so fortunate to be here, in this country, where it’s easy for people to speak out, whether it’s calling out a member of Congress or participating in a demonstration. Growing up in Ecuador, we moved around a lot. I also always saw my grandmother, father and uncles reaching out and engaging people. And if I was around, I would be in serious trouble if I did not introduce myself to everyone that was there. It was disrespectful not to. I would’ve never imagined myself as a lobbyist, but now when people are afraid to go to meetings, or events, or receptions by themselves, I just don’t even think twice about it. How did you get involved with Earthjustice? After graduating college, I ended up at the Labor Council for Latin American Advancement where I worked on international trade, labor issues and immigration. I was thrilled because there’s such a big disconnect between economic policies and social justice issues—the displacement of workers and how that’s linked to immigration. When you’re learning about economic policies, trade policies, what affects the ability of a worker to have a just and safe workplace with dignity and living wages, the environment is just another component, so I’ve always seen issues as interconnected. Many people, especially farmworkers, are exposed to a lot of harmful chemicals while simply doing their jobs. How are you working to correct this injustice? We’re reminding Congress and the Administration what EPA’s Worker Protection Standard is all about, protecting some of the most vulnerable workers, many of them children, from exposure to toxic pesticides. The WPS has not been updated in more than 20 years and we’re working to change that in partnership with farmworker, labor, civil rights, health and environmental organizations. This is a story for farmworkers and their families to tell in their own voice. 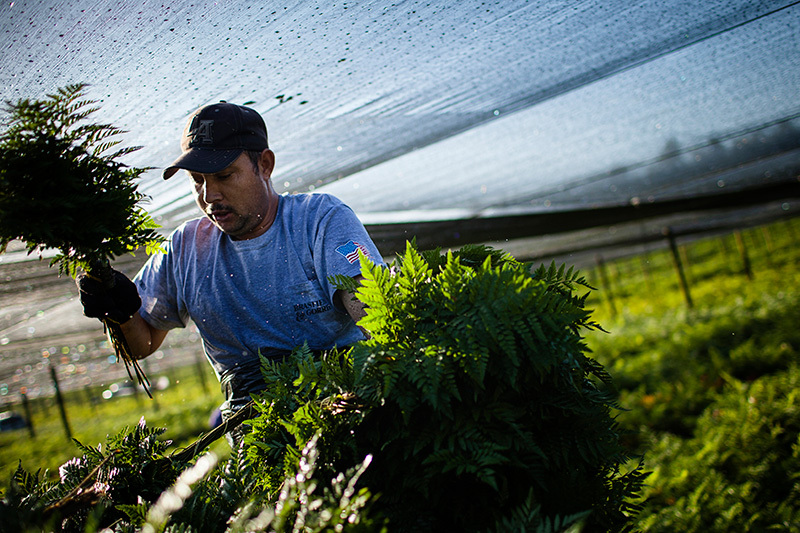 To this end, farmworkers met with Administration officials to connect an outdated policy to the reality on the ground, urging for stronger protections that are crucial to the health and well-being of over 2.5 million workers. Sorangel Tinajero, a former farmworker from California, told me: “All of these abuses and concerns that you’re talking about—we’re living it every day.” They said the majority of the women in this group have children with special needs—cerebral palsy, down syndrome, all these learning disabilities. 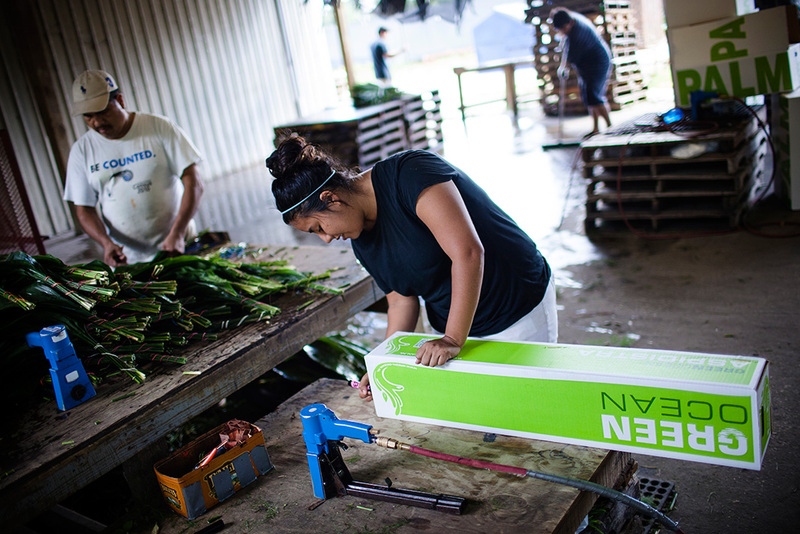 In Pierson, Florida, workers pick "sprays" of ferns, which are exported worldwide for use in floral arrangements and other decorations. It’s about putting a human face on a issue. When we accompanied farmworkers to congressional offices, it really struck a chord. The staffers were outraged to hear that there were pregnant women who were being forced to work, despite warnings from their doctor about what pesticides could do to their unborn babies. These are people who are literally getting sprayed with chemicals while picking crops. It’s one thing to read about this happening, but it’s quite another to hear it from the women who have no knowledge that these pesticides are hazardous. In some cases, they can’t afford childcare, so they bring the kids to the fields, and what does that mean for the kids? They’re the most vulnerable in getting exposed to these chemicals. It’s really outrageous. Typically, a worker gets paid 23 cents for each bunch of 20 sprays. The workers Earthjustice spoke with picked anywhere from 35 to 200 bunches a day. In addition to our work to protect farmworkers from pesticides, Earthjustice is also a part of the Safer Chemicals, Healthy Families coalition. SCHF works to strengthen toxic chemical regulations in the United States. We’re working collaboratively with consumer, health, labor, environmental and environmental justice groups, a broad base of allies because chemical safety reform is an issue that affects so many constituencies. When engaging new partners, once you explain how these issues affect families and communities that are predominantly Latino, largely immigrant and undocumented, folks that are among the vulnerable in our workforce, supporting something so fundamental—it’s a no-brainer. But it’s not just a matter of getting people to endorse a particular effort. You have to make sure that anyone you engage has the information and resources to effectively educate their respective membership and understand that education is a two-way street. The real win is when individuals and organizations have gained ownership over the issues and have found their own voice within a debate. What do you tell people who have never lobbied on the Hill before? When we get delegations from out of town, I meet people who are intimidated by talking to a senator or representative—but they shouldn’t be. Those legislators serve at the pleasure of the people. Our representatives should be all eyes and ears to hear from the people that put them there in the first place. I really care about being in touch with the clients and the impacted communities that we’re working with because that’s the lifeblood of our work. 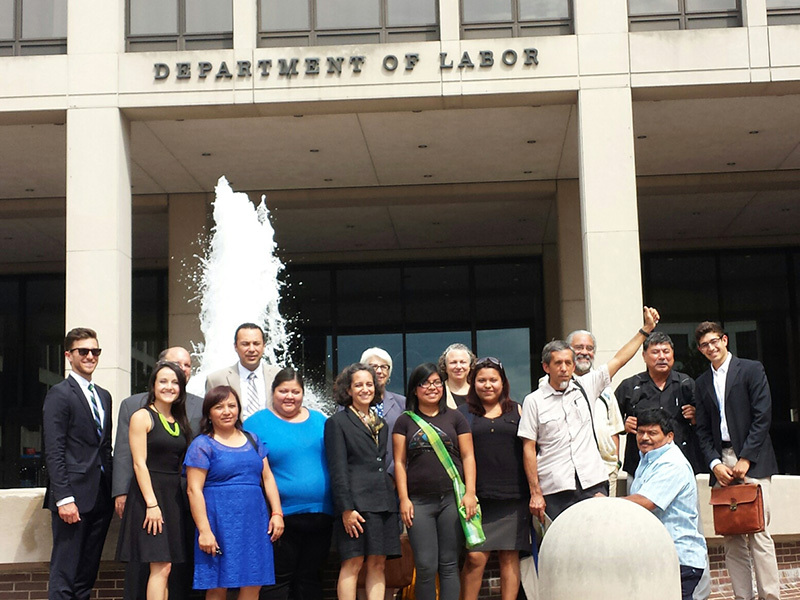 Andrea stands with community lobbyists, outside of the Department of Labor in Washington, D.C. Whether you’re talking to someone on the phone, via email, or meeting them and hearing their stories, it fuels your passion for what you’re doing and just reminds you why you wake up every day. When you’re frustrated you remind yourself about the affected individuals and communities, the principles of what we’re fighting for. Hearing our clients’ stories, it angers me and puts a face and a name to an issue. Knowing that there’s someone that I care about that’s being affected can only make you be a better advocate. You may not be directly impacted, but talking to the people reminds you who it is that you’re advocating for, like you’re an advocate of advocates. “Advocate of advocates.” That’s what we should really be calling you. My father always tells me, “With more knowledge comes more responsibility.” When you’re a lobbyist, you have all this access. You’re in a position to leverage power. You have this wealth of information that’s provided to you. 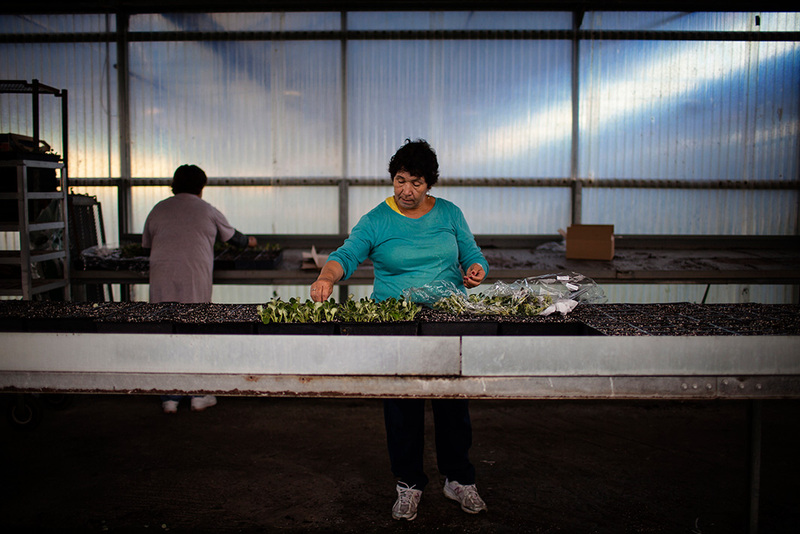 A farmworker prepares seedlings for planting in Apopka, FL. How we can bridge that to help really elevate the voices of the people most impacted by the issues we’re working on, is really the big task at hand. I feel very fortunate that people even allow me to walk with them and hear their stories. When they’re in meetings sometimes they come out and they’re like, “I don’t think I did a good job.” And I tell them, “You were amazing.” The most powerful thing that you can share is your story. That’s something that no one else can tell you how to do. These people are hearing from industry lobbyists left and right, but hearing the story of a family, of a worker, of a faith leader—there’s no money you can put on that. Andrea Delgado is a legislative representative with Policy & Legislation team in Washington, D.C. Hear more from Andrea on Earthjustice's blog, unEARTHED. And learn about Earthjustice's advocacy campaign to strengthen protections for farmworkers and reduce the risk of immediate and long‐term illness to farmworkers and their families: Protecting People From Pesticides. Every day, crop dusters spray a witch’s brew of toxic pesticides on farmworkers in the United States. One of the communities that has been impacted is Lake Apopka, Florida. This video tells their story. The farmworkers who help bring fresh fruit and produce to your table aren’t protected by the safety standards most workers in the U.S. enjoy. 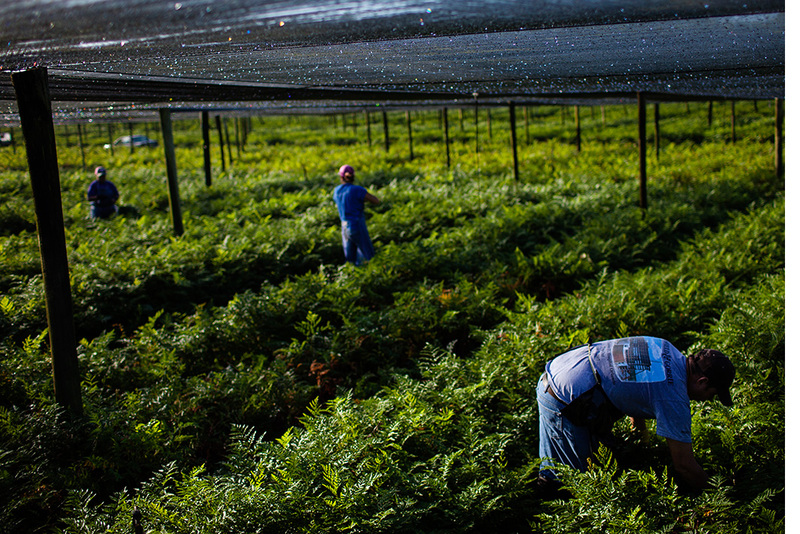 The farmworkers’ reality is often a nightmare of back-breaking work and repeated exposure to toxic chemicals. Special occasions often require a special touch, like a beautiful bouquet of flowers, a basket filled with luscious strawberries, or a bottle of the finest wine. But what about the people and places that harvested those crops before the date? How do they fare? "These people are hearing from industry lobbyists left and right, but hearing the story of a family, of a worker, of a faith leader—there’s no money you can put on that."